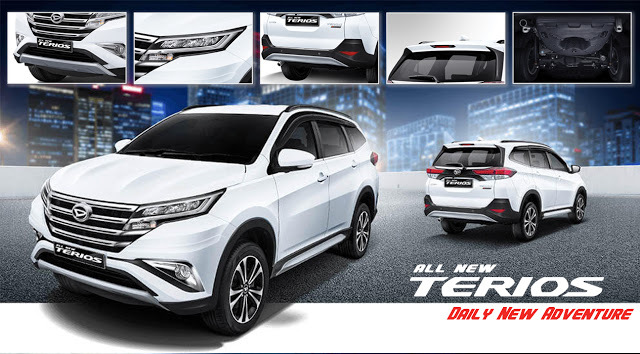 "... SPESIFIKASI DAN HARGA GREAT NEW XENIA "
Body colour front bumper, dark grey radiator grille, Full Wheel cap ( R13), Material color manual outer mirror, body color outer door handle, body color back door garnish with lens. Dual Airbag SRS, Safety belt with pretension & force limiter, power window jam protection, side impact beam, seat belt, parking brake & door ajar warning. Cover fog lamp, chrome radiator grille ( 4 layer ), chrome lower side body molding, Rear spoiler + HMSL, Back door glass chrome list, Scuff Plate. Cover outer mirror with turn lamp, cover fog lamp, Alloy wheel (R14’’), muffler cuter, front bumper aerokit, side skirt, Rear bumper aerokit, Chrome radiator grille ( 4 layer ), Chrome lower side body molding, Chrome window graphic, Back door chrome ornament, Rear spoiler + HMSL, Back door glass chrome list, Scuff plate. ... SIAAAAAP Melayani Pembelian Kendaraan Daihatsu " Great New Xenia, AYLA, New Terios, New Sirion, LUXIO, Gran Max ". Untuk Perorangan Dan Perusahaan Secara Cash, Kredit, Dan Trade-In.